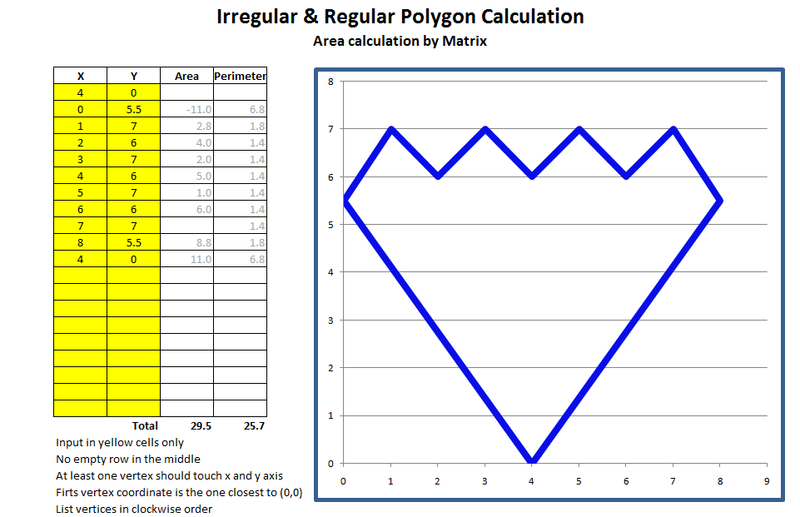 The attached Excel document calculates the area of ​​irregular polygon and regular polygon with matrix formula. This formula is quite popular as in the mathworld and wikipedia page. But this formula is rather difficult to understand, and somewhat difficult to review the result of calculation. 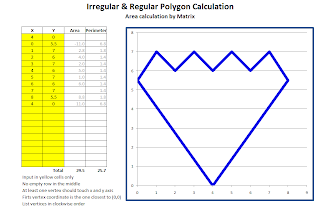 Calculate the area of ​​a polygon with rectangles formula that is easier to understand and checked, can be read in the following article. Both articles use the Excel document, and use the same formula to calculate the perimeter or circumference of the polygon. I let you to decide which formula is suitable for your condition. Maximum 19 polygon vertices that can be counted, can be added by copy-paste-insert row in the Excel sheet. Input only in yellow cells, no empty line in the middle. At least there should be one vertex touches the x axis, and one vertex touches the y axis. The first vertex is the point closest to 0 (0,0). Register vertices in column x and y sequentially in clockwise order. Calculation for land lot area and perimeter with GPS coordinates, click here.